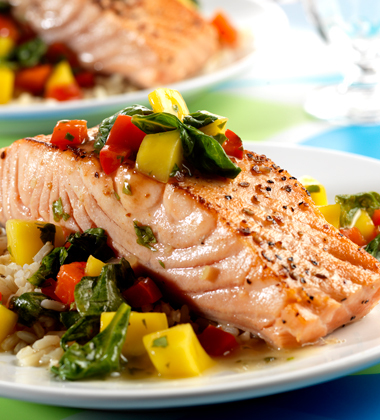 Sautéed salmon is melded with a rich V8 V-Fusion Peach Mango sauce and enhanced with chunks of mango and spinach leaves. Finished with cilantro. salmon, 6 oz portions	 9 lb. 24 ea. cracked black pepper	 2 tbsp. 1. Place salmon fillets, skinned-side-down in one even layer on a full sheetpan sprayed with cooking spray. Mix pepper and salt and sprinkle evenly onto tops of each fillet. Pat down and spray with cooking spray. 2. Heat oil in a large skillet over medium-high heat for 1 minute. In batches, add salmon, skinned-side-up, making sure not to over-crowd the skillet, and cook 3 minutes or until well-browned. Flip salmon fillets over and continue cooking 2-3 minutes or until salmon flakes easily when tested with a fork and internal temperature is 165°F. or higher for 15 seconds. 3. Remove from skillet, placing skinned-side down on a clean sheetpan and keep warm. Repeat process to finish remaining fillets. Pour off used fat. CCP: Hold hot 140°F or higher for service. 4. Add new oil and heat over medium-high heat; add chopped pepper to same skillet and cook, stirring often, for 2 minutes. Stir in garlic and continue to sauté 1-2 minutes, until crisp tender. cracked black pepper	 1 1/2 tsp. brown rice, cooked, hot	 85 oz. 3 qt. cilantro, sprigs	 2 oz. 24 ea. 5. In a bowl mix together juice, mango, honey and pepper; in another small bowl mix lime juice and cornstarch until smooth and whisk cornstarch mixture into mango mixture until smooth. 6. Add juice-mango mixture into skillet and whisk constantly until mixture begins to thicken and boil. 7. Stir in spinach and cook until spinach is completely wilted and mixture is thickened, stirring often. Boil 1 minute. Remove from heat and stir in cilantro. CCP: Hold hot 140°F or higher for service. 8. For Each Serving: Plate 1/2 cup hot rice onto plate and top with a salmon fillet. Ladle 1/2 cup sauce with spinach and mango over top of salmon and serve immediately, garnished with cilantro sprigs. salmon	 9 lb. 24 ea. brown rice	 85 oz. 3 qt. cilantro	 2 oz. 24 ea.